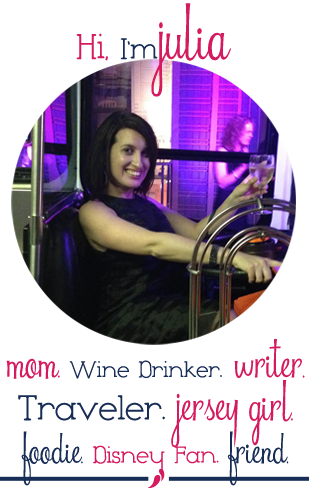 The hours between 3:00, when I pick Jack up from school, and 6:00 when Grace goes to bed are the longest of the day. Juggling two kids, getting snacks, starting dinner and keeping them both entertained has me exhausted before I’ve even sat down to dinner. A few weeks ago we had a string of spring-like weather and after school we headed straight to the park with friends. Getting some fresh air and running around made those after school hours so much easier. We’ve been making a point now to get outside after school as often as the weather allows. Monday was the first day of spring and hopefully, the start of warmer and longer days. 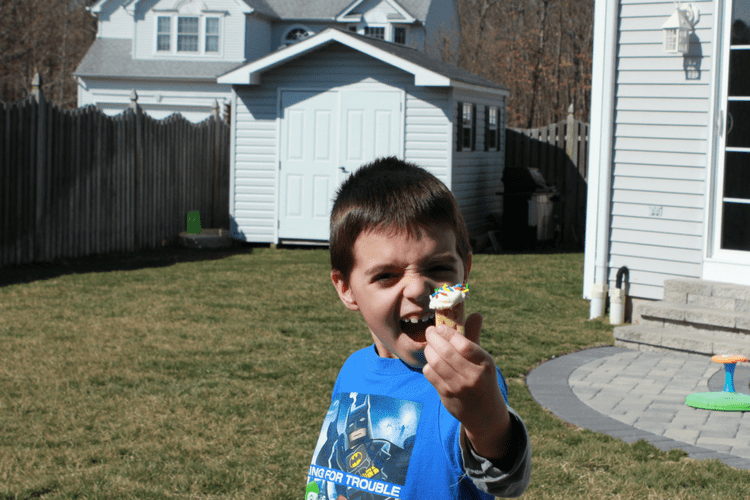 When I noticed how nice it was on Monday I decided to make Jackson a special snack to celebrate the first day of spring. After school snack time is one of the few moments in the day that we usually get to have to ourselves. After school Grace will play in her pack n play while Jack and I have a snack and talk about his day. It might just be 5 or 10 minutes but it gives us a chance to have some one on one time and talk about his day. I love this part of our after-school routine and something about sharing a snack together makes it easier to talk. Usually when I first pick him up from school he’s tight-lipped on how the day went, but once at home having something to eat he’s happy to fill me in on all the kindergarten gossip. Since the weather was so nice I put his snack on a tray and we took it outside to eat. 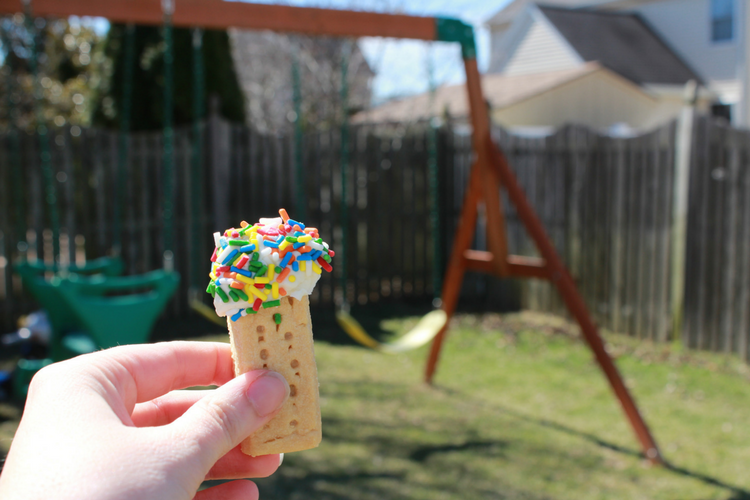 It was a beautiful day for a spring snack and I have a feeling he’s going to be requesting this snack again since he tried to hide the frosting and sprinkles after he was finished. Place frosting and sprinkles each separate bowls. 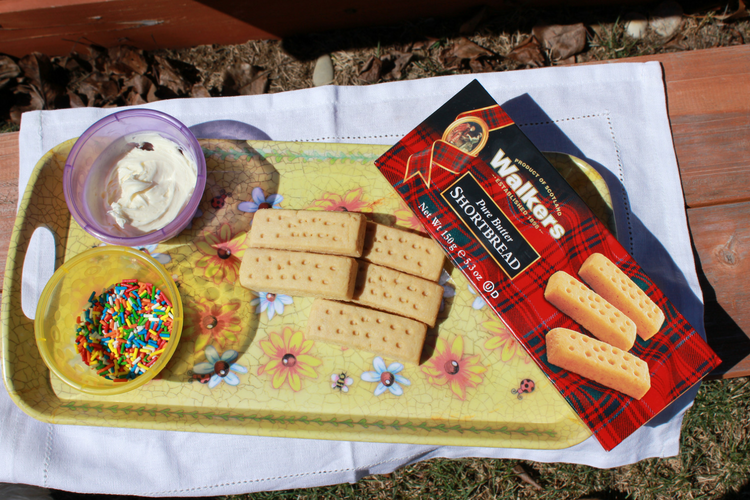 Dip Walkers Shortbread fingers in the frosting and then into the sprinkles. This is a sponsored post on behalf of Walkers Shortbread, all thoughts and opinions are my own. 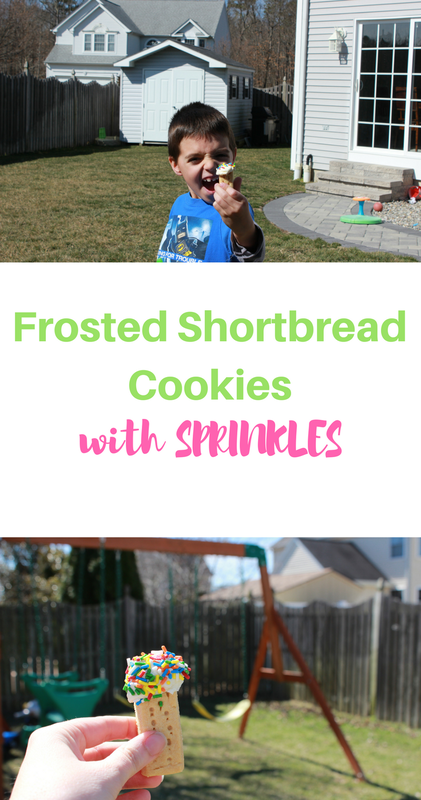 So fun to make with kids!